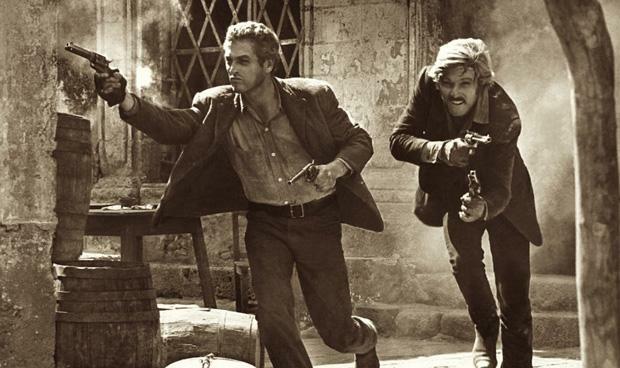 We were watching "Butch Cassidy and the Sundance Kid" on Netflix the other day. In the 70s this was the acme of high end film making. The whole nation stopped and watched when it was finally shown on BBC TV. You watch it now and the first thing that strikes you is how cheap it was. The modesty of the whole enterprise makes it seem as far distant as the silent era. There are no big set pieces or special effects. All the money must have gone to Newman and Redford, who are, it's fair to say, almost hurtfully beautiful. When the action moves from the West to South America it's done via a montage of stills. And we don't see the big ending. They come out shooting and the frame freezes. They would never do that now, I said to a young person. No, he said, because for a start they would already be shooting a sequel. We saw the film on its original release. Thoroughly enjoyed it. It was on one of the Freeview channels a couple of weeks ago; Film Four, I think. We recorded it and had a look. Again, enjoyable, although “Raindrops Keep Fallin’ On My Head” was more of a dirge this time around and Bacharach’s score grated more than a bit. It doesn’t look as cheap as “The Sting,” which seemed to be all economy-size studio lots. I recall a TV documentary on the making of the film shortly after release; very good. All the usual gubbins. How they had to get the dynamite scene in one take and if I recall correctly had as many as five(!) cameras on standby. How in the scene where the posse burst out of the carriage of the pursuit train, they had the riders charge from one side the of the rails, through the carriage and out the other side. Then there was the “suicide leap” with Newman and Redford hopping about three feet onto a platform and two stuntmen jumping off a crane on a backlot somewhere. How Newman happily(?) volunteered to (sort-of) ride between the two mules just prior to the finale. All good stuff. Never repeated, long before video-tape. Might be on Youtube somewhere, I suppose. Or even an extra on the DVD release. I’ve checked: It seems to be some of the DVD releases. Probably completely different to my memories. Apparently almost all the stills were actually filmed, but to cut the film’s length, the stuff was chopped about and became the black and white (or was it sepia) clips. Interesting that this and very different, but equally enjoyable “The Wild Bunch” were released in the same year. Strother Martin doing his usual stuff and good as ever in each one.